Mix all ingredients, except bottle of oil and powdered sugar, into a smooth dough. Roll (or press with hands) to 1/2 inch thick. Use an empty tomato paste can to cut out the doughnut hole. Use an empty tomato sauce can (or water bottle lid) to cut out the doughnut. Heat about 2 inches deep of vegetable oil to 375-400 degrees for Frying. The smaller diameter of the dutch oven, the better to cut down on oil needed and heating time. 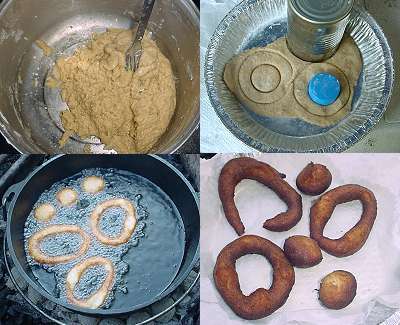 Carefully drop doughnuts and holes into hot oil. They will sink and then float back up as they cook. Fry until golden brown, flipping once. Drain on paper towel and sprinkle with powdered sugar. Keep the oil hot or the doughnuts may get greasy. Let me know how you enjoyed your Dutch Oven Doughnuts!